Paramount announced last week that their highly-anticipated Terminator reboot has started production, which features Arnold Schwarzenegger reprising his iconic role as a T-800 Terminator, who, despite being a robot underneath, is still aging. 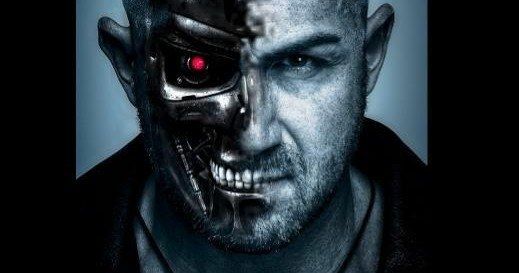 The Terminator Fans reports that bodybuilder/actor Aaron V. Williamson has signed on to play a younger T-800 Terminator, after discovering a now-deleted post on one of the actor's social networking pages, which you can read below, along with the following piece of concept art. "Thanks to an amazing team of people who help me get better each week, both physically & creatively, I'll be playing a T-800 (Terminator) in the upcoming production Terminator: Genesis. I'm extremely grateful & motivated as this new chapter begins to take shape." While this casting hasn't been confirmed by Paramount, it would make sense since Arnold Schwarzenegger revealed in March that there is also a younger T-800 in the reboot. After that statement and photo were taken down, The Terminator Fans reached out to the actor about his role. While he confirmed that he has been cast, he wouldn't divulge any specific details. "I'm not really at liberty to discuss anything with regard to this part. My social media followers have been following my journey since I returned to the states from Iraq, which is why I shared that photo; my desire to overcome adversity has really moved people. Where I'm at in my life right now is destiny & it's truly a blessing. I grew up as a skinny kid watching the original Terminator & was fascinated by Arnold which is the man who inspired my career in fitness. To be a part of this production is a dream come true & a very special moment for me." In related news, Hitfix revealed that this new Terminator overlaps with the original 1984 classic. ""Kind of like Back to The Future, the Terminator: Genesis script folds into the first film in the series.... There's a scene in the script where literally, we see the scene in the first Terminator where Arnold steps out, the punks threaten him, he rips Bill Paxton's heart out and takes his clothes and wanders off. And as soon as that scene ends, another Arnold Schwarzenegger who's older, and bearded and a very different version of the Terminator, comes walking in from the other side and plays another scene, right at the scene of that first incident." It's possible that Aaron V. Williamson is playing the younger T-800 in this scene, before Arnold Schwarzenegger's aging Terminator emerges. However, since Aaron V. Williamson said he's playing "a T-800," and not "the T-800," it seems that he may be playing different variations on the T-800 model. There have been rumors that the story would begin before Sarah Connor (Emilia Clarke) encounters the Terminator in 1984, and that Arnold Schwarzenegger's aging T-800 may have been guarding her for over 30 years. As for Aaron V. Williamson, he has only appeared in an uncredited role in last year's G.I. Joe Retaliation and the upcoming American Heist, but he has also worked as a fitness trainer/fitness professional on a number of recent movies, including Captain America: The Winter Soldier, Neighbors and Sin City: A Dame to Kill For. He is also listed as a fitness trainer for Terminator.